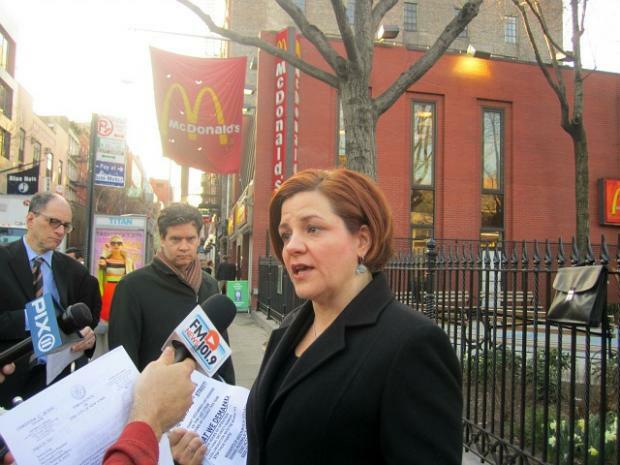 GREENWICH VILLAGE — City Council Speaker Christine Quinn called for a boycott Monday of a McDonald's that's been plagued by violence until management hires off-duty NYPD officers to bring security there under control. Quinn and members of Community Board 2 and the Bleecker Area Merchants and Residents Association passed out fliers near the West 3rd Street fast-food joint asking for additional security and collaboration with the NYPD. "We're asking folks in the neighborhood not to support this McDonald's until this McDonald's supports the neighborhood," Quinn said. "The first thing this McDonald's needs to do is engage better security through the paid detail option that our police department offers," Quinn said. "Those are off-duty police officers trained in how to do this type of security. That will be a huge step forward, make a difference and be a show of good faith." A video shot on March 17 at the McDonald's location and posted on YouTube showed a large fight on the sidewalk outside the restaurant, where young men were seen tackling and kicking each other. The St. Patrick's Day brawl followed two previous instances of violence there. Last October, McDonald's worker Rayon McIntosh was caught on video — first published by DNAinfo — using a metal rod to beat two women who had jumped over the counter to attack him. McIntosh was initially charged with assault and weapons possession, but a grand jury cleared him after finding he had acted in self-defense. The two women have since been indicted on burglary charges. 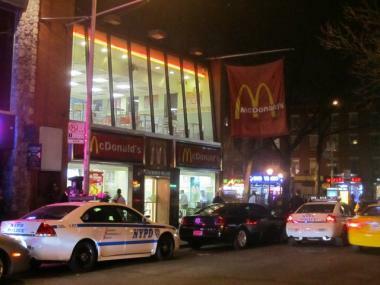 McDonald's franchise owner Carmen Paulino said in a statement Monday that the restaurant has had a security guard Wednesday through Saturday nights since last summer, but she did not respond to the request that she hire NYPD detail. Paulino will meet with 6th Precinct officers this week, a spokeswoman for the McDonald's location said. A letter to Paulino signed by Quinn, Rep. Jerrold Nadler, Sen. Tom Duane, State Assemblywoman Deborah Glick, and Manhattan Borough President Scott Stringer asked for a meeting the week of Monday, April 2. "As a business owner you have a responsibility to not only ensure your business continues to thrive, but to help insure the safety and wellbeing in and around the immediate area of your establishment," the letter said. McDonald's management should be responsible for security both inside and in front of the restaurant, Community Board 2 chair Brad Hoylman said. "What happens outside their business should be their responsibility to manage," he said. Village resident Paul Noonan, 30, said he supported the McDonald's boycott. "The fact that there's been repeated violence there is unacceptable," he said. McDonald's customer Christine Arambulo, 27, said she would continue to patronize the West 3rd Street location near her office. "I think [the call to boycott] is a little ridiculous," she said. "It's not McDonald's fault. The drama that's happened there could happen anywhere, with so many bars here." Police sources told DNAinfo in October that the restaurant's management chose not to hire off-duty NYPD officers as security staff because it "wasn't in their financial interest." The restaurant's marketing manager, Maritza Reveron, said in October that safety at the fast-food joint is the responsibility of police, not private guards.